Imperial Stormtrooper signing an autograph book during Star Wars Weekend at Disney’s Hollywood Studios. Nikon D700/28-300VR, 1/160s, f/6.3, ISO 200, EV +0.3, 105mm focal length, fill flash. As I mentioned in the last post, the Imperial Stormtroopers were the comedy relief of Star Wars Weekend. These are the fearsome stormtroopers of the Empire, not the Republic stormtroopers of the Clone Wars. Making it doubly entertaining and funny to see one signing a Disney Princess autograph book with a Minnie Mouse pen for a guest. My first experience with an Imperial Stormtrooper was as I was taking a few photographs of one and he decided to mimic me. I previously shared one of those photos and here it is again with the other two. Making for a funny triad. Imperial Stormtrooper mimicking someone taking his photograph above the entrance to Disney’s Hollywood Studios. While most of the Star Wars characters queue lines for autographs and photos were close to, if not longer than an hour, there were many Imperial Stormtroopers around, the wait was normally less than fifteen minutes for one of them. How could I resist? 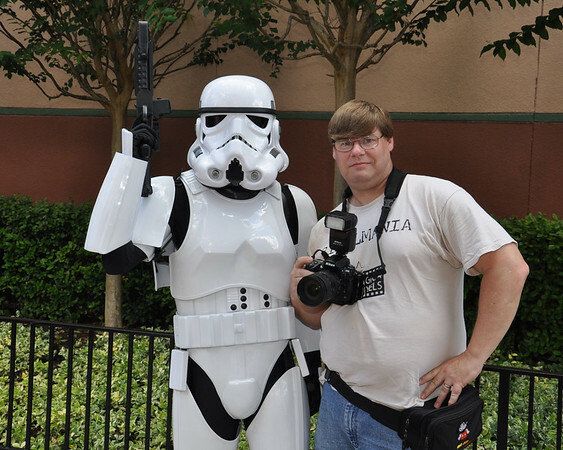 The blog author posing with an Imperial Stormtrooper during Star Wars Weekend at Disney’s Hollywood Studios. Looks like they both choose to serve the Dark Side of the Force. Photo by Walt Disney Company. Used by permission. If you ever go to a Star Wars Weekend at Disney’s Hollywood Studios, check out the Stars of the Saga shows. Imperial Stormtroopers are the stars of the pre-show. 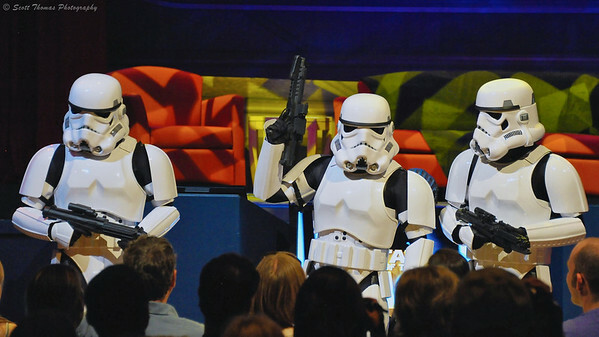 This year, a Stormtrooper Commander comes out and asks the audience if they have seen the rest of his patrol. Soon, a couple of them showed up on stage looking a lot like guests of the park after a full day’s visit. See for yourself below. Imperial Stormtroopers talking about their day at Disney’s Hollywood Studios during the Stars to the Saga pre-show at Star Wars Weekend. The Commander was not amused and took their memory card to be displayed on the theater’s big screen. While out on patrol, the stormtroopers documented themselves riding such popular attractions as Rock and Roller Coaster, Tower of Terror and Star Tours while consuming a few Mickey Ice Cream bars, popcorn and hot dogs. They even had Mickey Mouse ears which further upset their Commander. If I was to name them, they would be Curly, Larry and Moe as they acted like the Three Stooges a few times during the show. Imperial Stormtroopers entertaining the audience before the Stars of the Saga show during Star Wars Weekend at Disney’s Hollywood Studios. Nikon D700/28-300VR, 1/160s, f/5.6, ISO 4000, EV -1.0, 150mm focal length. The next time I watch a Star Wars movie, the Imperial Stormtroopers will not seem as fearsome as they once did. 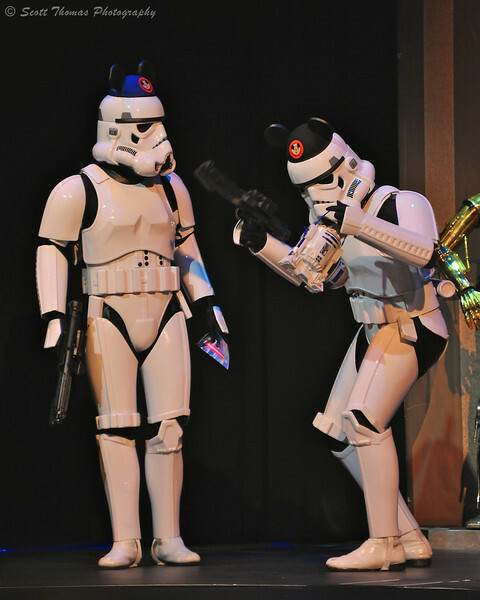 This entry was posted in Travel and tagged 28-300mm, disney's hollywood studios, entertainment, florida, fun, imperial stormtroopers, mickey mouse ears, nikon D700, orlando, star wars weekend, vr, walt disney world. Bookmark the permalink. Pingback: Sand warriors | Just another . . . . . . . . . blog! 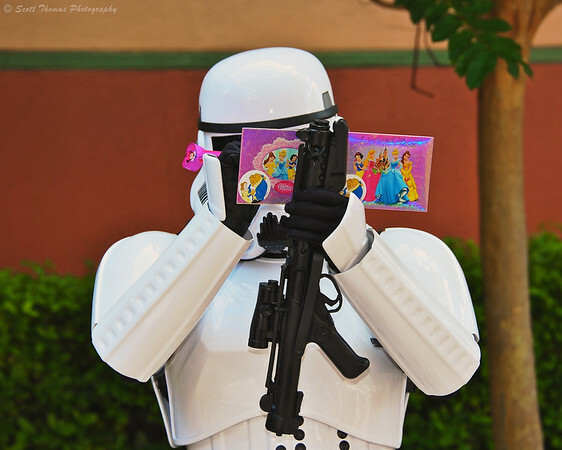 LOL, Stormtroopers with Disney Princess gear and Mickey Mouse ears – too cute! Cute…a word one would never think to associate with these guys! How funny to see a Stormtrooper signing a Princess autograph book! What did he/she actually write in the book?